The Giant Ferris Wheel is a famous sight in the Prater amusement park Vienna. The ride was built in 1897. Around 1900 Giant Ferris Wheels were high-tech and in great demand. Also in the USA and Paris similar big wheels were finished at this time. The Vienna Ferris Wheel is still the largest Ferris Wheel in Austria. With the Vienna Pass you can ride a round for free. The wheel on the Prater has a diameter of almost 61 metres. In the entire German-speaking area, there is still no larger Ferris wheel today, 120 years after its construction. But there are many bigger ones all over the world. The largest Ferris wheel in Europe is known, the London Eye in London with a height of about 110 meters. This gigantic wheel was completed at the turn of the millennium in the year 2000. Even bigger is „The High Roller“ in Las Vegas (USA) and some giant ferris wheels in China and Singapore. The Wheel of Venice in Lido di Jesolo has about the same hight as the one in the Prater Park Vienna. The good old Vienna Giant Ferris Wheel currently has 15 cars, up to the Second World War there were even 30. The cars (see picture) are reminiscent of railway cars. The fares are not too high, for 10 Euro (beginning of 2017) you get a ticket. The journey time of the Giant Ferris Wheel in the Prater Vienna is different and depends on the number of passengers. The more people want to ride, the shorter the turn. However, there is always enough time to enjoy the view over the city of Vienna and the nearby Danube. Also the view to the other rides in the Prater is interesting from above. Many inhabitants of Vienna also recommend a ride after sunset over the brightly lit metropolis. The entrance fee for the Giant Ferris Wheel in Prater Vienna is currently (February 2018) exactly 10 Euro. Children pay a fare of 4,50. For such an important sight this entrance fee is appropriate in our opinion. Tickets for 10 Euro are available on the Internet at Getyourguide. The journey takes about 15 minutes. You can ride a Ferris wheel for free with the great Vienna Pass Vienna. This ticket is also valid for sightseeing buses and about 60 other sights in and around Vienna such as the wax museum in the Prater. More about the Vienna Pass on the well-known website Getyourguide. 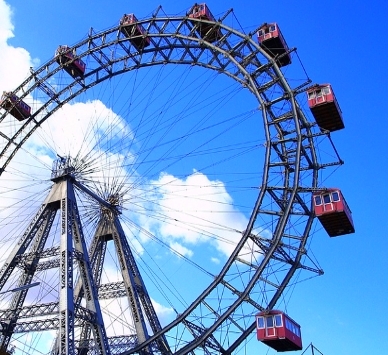 The famous big wheel in Vienna was closed for a few days in January. Since about 20.1.2019 the wheel has been turning again after the every year winter renovation. 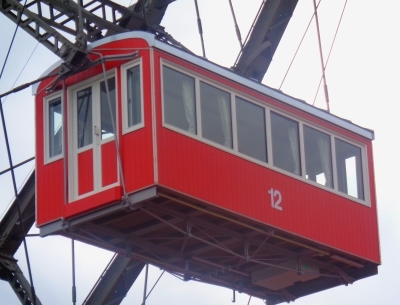 The opening hours of the Vienna Giant Ferris Wheel depend on the season. In winter you can ride from 10 am to 19:45 pm. In summer the opening hours are even longer. In May, June, July and August the opening hours are mostly from 9 to almost midnight (23:45). On New Year’s Eve you can watch the festivities above the city of Vienna from above, then you can ride along until 2 am. Only at Christmas Eve there is a somewhat shortened opening time until 16:45. Except in the two weeks for maintenance in January, as far as we know the „Vienna Giant Ferris Wheel“ turns every day in 2019 for the visitors. I will be about the same in 2020. The best stop for public transport is Praterstern (U-Bahn and S-Bahn). The U1 (red line on the map) connects the Prater directly with the centre of Vienna (Stephansplatz). The U2 (purple line) also goes to the city centre (Hofburg, Parliament, Burgtheater, City Hall, central museums, etc.). The wax museum Vienna is also only a few hundred metres away in the Prater amusement park.